Arraignment is the defendant’s second formal court appearance. The sixth amendment to the United States Constitution guarantees that the accused shall “be informed of the nature and cause of the accusation” against him. At common law, the charge was read to the defendant so he could be fully informed. The defendant would then plead guilty or not guilty. Today the defendant is given a copy of the charge. The formal reading of the charge or indictment is waived and a trial date is scheduled. Arraignment is also used for other administrative matters. The judge or clerk will call the docket. The defendant answers when his name is called. If the defendant is a prisoner, he will be brought into the courtroom. The judge will verify he has the correct person and the correct charge. Alternatively, the law authorizes the court to arraign prisoners without the need to transport them to court using video. The judge and court personnel are in court while the defendant remains in jail. Arraignment is conducted over a video link. Whether arraignment is conducted in person or by video, the judge will direct the prosecutor and defendant or his attorney to agree on a trial date. Customarily the defendant will waive the formal reading of the felony indictment or misdemeanor charge because the defendant receives a copy of the charge. If the defendant refuses to plead or enters an irregular pleading, the court will enter a not guilty plea and set the case for trial. It is a good idea to plead not guilty at arraignment even if you think you are guilty. You have the constitutional right to consult an attorney and discuss your defenses. If you retain an attorney, he can appear at your arraignment without your being present. Your attorney will contact the court, obtain a copy of the charge, select a convenient trial date, and confirm in writing with the court. If you fail to appear at arraignment, a warrant for your arrest will issue and your bond will be forfeited. You can be tried in your absence. If the charge is a felony, arraignment comes after indictment. For misdemeanor charges, arraignment comes after the charge or ticket is served on the defendant. Once your guilty plea is accepted, the only thing left for the judge to do is sentence you. The judge does not have the authority to go back and reduce the charge to something less serious or dismiss the charge outright. The court did not file the charge and does not reduce the charge. The prosecutor is generally not present to evaluate your case at arraignment. Only the prosecutor can reduce the charge to something less serious. Once you plead guilty to the charge, you have a record of conviction. You will have to live with the consequences of this conviction. Generally, first offender programs are not available at arraignment. For example, the prosecutor must screen your case in order to determine whether deferred adjudication is an option. If you plead guilty at arraignment, you give up every possible defense to the charge. You will never know whether the prosecutor would have exercised prosecutorial discretion in your favor. Pleading guilty at arraignment gives up the opportunity to obtain discovery (police reports). By pleading guilty at arraignment, you also relieve the prosecution of further constitutional obligations to produce exculpatory material tending to prove your innocence. Even if you think you are guilty, you should consult an attorney to minimize the consequences of going to court. The best Mississippi criminal defense attorneys will help you evaluate your case after considering the facts and the law. Federal court arraignments take place at the Dan M. Russell, Jr., United States Courthouse located at 2012 15th Street, Gulfport, Mississippi. Federal court arraignments are governed by Rule 10 of the Federal Rules of Criminal Procedure. The defendant is provided with a copy of the indictment or information. The United States Magistrate Judge in Gulfport will inform the defendant of the minimum and maximum prison time and fines for each charge. The Magistrate will also enter a discovery order and scheduling order setting the case for trial. At arraignment, the court will address the issue of bail or detention. 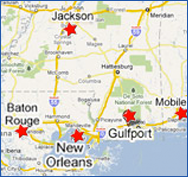 In the Southern District of Mississippi, if bail is granted, it is generally a $25,000 unsecured appearance bond. If bail is denied, the defendant is entitled to have a detention hearing. A preliminary hearing can be also scheduled. Sometimes the initial appearance is mistaken for arraignment since both involve informing the defendant of the charges. Unlike initial appearance, at arraignment the defendant and his attorney will be asked to plead guilty or not guilty. Further, at arraignment scheduling orders for discovery and trial will be entered. The judge will also rule on other administrative maters. We will represent you at arraignment. You will not have to be present. We will help you avoid the time and expense of unnecessary travel so you can continue to work. We will arraign you not guilty. We will obtain the discovery and help you evaluate your charge including any available defenses. Call the Law Office of Rufus Alldredge at 228.863.0123. We are located at 1921 22nd Avenue, Gulfport, Mississippi 39501.